SIX NATIONS - Enbridge Pipelines Inc. set up an information meeting at Six Nations Tourism on August 11th from 3 pm 7 pm. Mark Bowler, Manager of Stakeholders and Aboriginal Affairs, said, "Elected Council wanted to have this open house." Bowler told those gathered that Enbridge Pipeline Inc. needs to replace the existing Line 10 pipeline. Line 10/11 is a 146 km long pipeline built in 1962 that runs from Westover to West Seneca, NY. According to Enbridge, a 40km section of the pipeline starting north of Six Nations territory running through Brant County and ending just east of the Hamilton International Airport at the Nanticoke Junction will be replaced this year. As part of the replacement sections of the line will be "decommissioned"; essentially this means they will be drained and capped off and will remain buried on-site underground. According to Enbridge this is the "safest and least disruptive available option. When we decommission a pipeline, we continue to look after it. Landowners are not responsible for Enbridge's decommissioned pipelines - we are. Forever." Enbridge says that leaving the decommissioned sections of pipeline on-site and underground will prevent disturbing "farmlands, neighbourhoods, roadways, wetlands, and green spaces, which we prefer to avoid whenever possible." The replacement process involves draining the crude oil from the pipeline, flushing it, segmenting it and treating the pipeline so it does not corrode. Enbridge says Line 10 currently transports 63,500 barrels a day of Canadian crude oil to a refinery owned by the United Refinery Company in Warren, Pa. Documentation distributed by Enbridge about the Line 10 replacement reads, "Our Line 10 Westover Segment Replacement Project involves replacing an approximately 35-kilometre section of 12-inch-diameter pipe with 20-inch-diameter pipe. Following project completion, Line 10's average daily capacity will more closely approximate what the line has carried in the past. This segment replacement is not about expanding the capacity of Line 10 - it's about routine maintenance and fitness of our lines." According to the Oil and Gas Journal, United Refining Co. entered into a maintenance and upgrade agreement with Enbridge for the section of Line 10. The pipeline carries crude oil from Canada to an oil refinery in Pennsylvania. United Refining funded Enbridge in 2014 with $36 million in integrity costs for the project and another $28 million for half the cost of replacing the pipeline. Enbridge says that the project of replacing the existing pipeline is expected to carry on going well past 2018. "Pending regulatory approval, the Westover-to-Binbrook segment is scheduled for replacement in 2017. Based on our current analysis of future shipper needs and maintenance requirements, replacement of other segments over the subsequent several years is expected to be the optimal pipeline management approach; it is anticipated that applications for those replacements would be filed in 2018 and later." Many community members present at the meeting were unaware not only about the line replacement project but that an oil pipeline was present on Six Nations territory to begin with, Toni Anthony, a Six Nations Band Member and local catering business owner present at the meeting was shocked with the information being presented. Anthony said, "I didn't even know what questions to ask." Community members chatter in the parking lot was slightly more confrontational than inside. Six Nation's Police presence may have deterred anyone from acting out. When asked why they were there Six Nations Police Constable Tim Bomberry said, "Just want to make sure everyone's cool, that's all." Bowler says if all goes as planned the pipelines will be replaced and run better than before, however, an oil spill is always a possibility. Bowler said that the pipeline has been there running safely for up to 50 years in some cases. "We gotta make sure they continue to work and work well and that people are prepared in case something goes wrong... "
most efficient, and most environmentally responsible method of transporting the energy we all use." However, according to information published by the Polaris Institute and estimated 804 spills occurred on Enbridge Pipelines between 1999 and 2010. Approximately 161,475 barrels of crude oil has spilled into the environment. Conversely, according to one of their booklets, Our Approach to Pipeline Valve Placement, "Enbridge meets or exceeds regulatory requirements by using an Intelligent Valve Placement (IVP) program.." It also says, "... our Number 1 priority - the safety of the public and the environment, and the operational reliability of our systems." Although Line 10/11 doesn't run through the immediate territory of the Six Nations Reserve it does cross the territory belonging to the Six Nations of the Grand River, through Brant County and along Highway 6. In that respect, an oil spill anywhere along Line 9, 10 or 11 will affect Six Nations as well as any wildlife or waterway in the area. Enbridge officials distributed a pamphlet at the meeting entitled, Aboriginal and Native American Policy. It states, "Enbridge recognizes the history, uniqueness and diversity of Aboriginal and Native American Peoples." 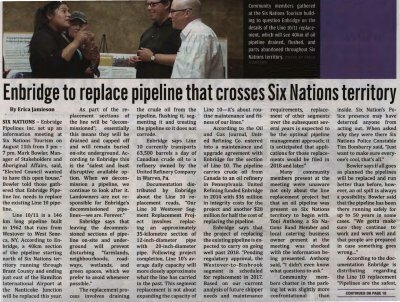 Despite Bowler's main objective to maintain and build upon current relationships between Enbridge and Six Nations it was clear that Bowler didn't know much about who governs the community. One community member at the meeting asked, "Who is Six Nations to you?" Bowler responded, "That's what we are here to find out. We hear from different people that Six Nations is governed by this group of people and we don't judge that... we don't presume to predetermine the way that Six Nations is governed." Bowler, Mark ; Anthony, Toni ; Bomberry, Tim. Enbridge Inc. ; Six Nations Tourism ; Hamilton International Airport ; United Refinery Company ; Oil and Gas Journal ; Six Nations Police ; The Polaris Institute ; .